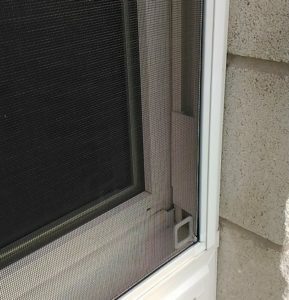 Why is uPVC so special? uPVC windows (also known as vinyl windows) has been replacing wood and aluminium window frames across the world since the 1950's because of it's improved thermal insulation, durability, and physical properties. 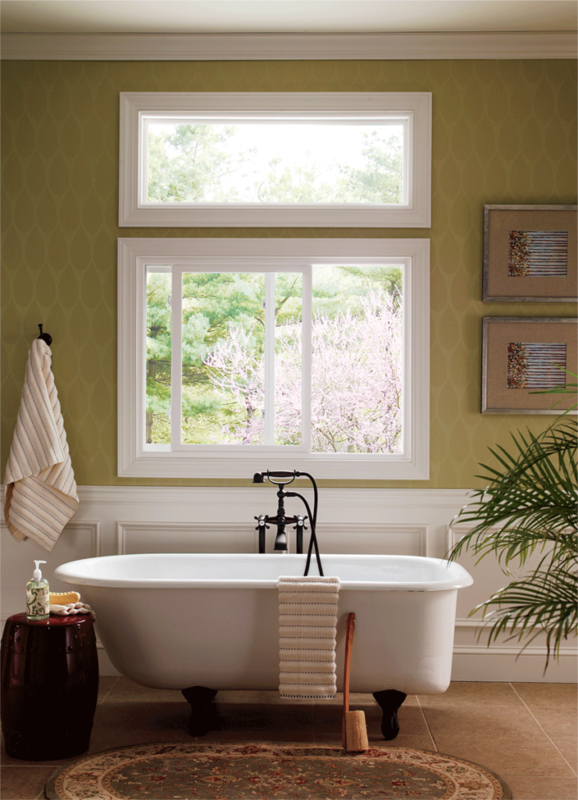 uPVC windows now account for over 60% of all residential window sales in the USA. The balance is mostly wood, not aluminium. One major reason for its increase in popularity is because uPVC is an insulator, unlike aluminium. It helps keep your home more comfortable by minimizing heat transfer through your joinery and minimizing (often eliminating) condensation on the inside of the window frame. Look at the heat transfer rates in the table. As you can see, aluminium is a terrible insulator and transfers 1000 times more heat than uPVC. There's a reason why this material is used for frying pans and other cookware! 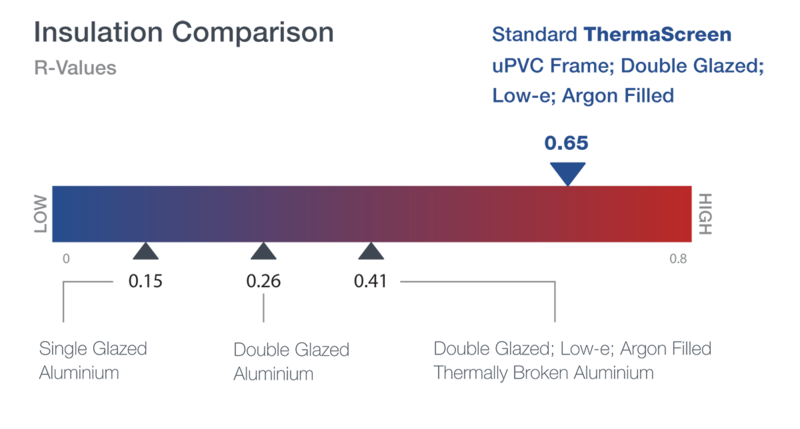 Below is a comparison of average window thermal performance for aluminium frames, thermally broken aluminium frames, and our multi-chambered standard uPVC frames. R-Values are commonly used to measure the insulating properties of materials with the higher R-Value being a better insulator. In other countries, uPVC is the most popular residential window material. 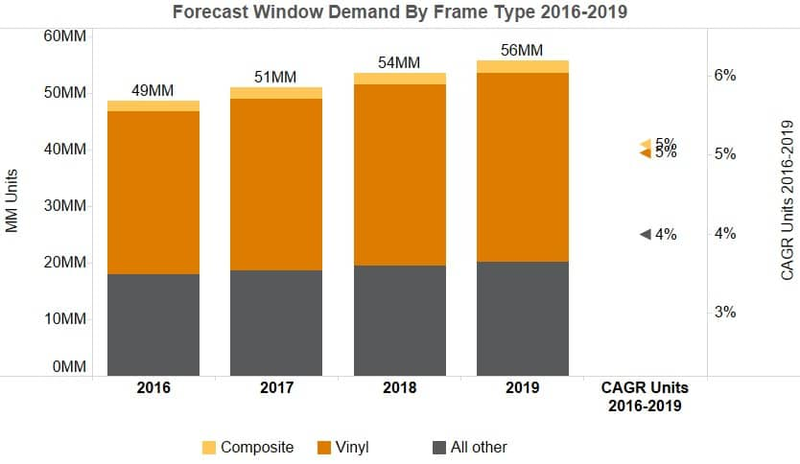 In the US, over 60% of all new windows are uPVC, and that percentage is rising. Approximately 35% is shared between both wood and aluminium windows. An independent construction consulting firm Principia states the reason is that "uPVC and composite windows include lower cost which can be half the cost of wood, scratch resistant, reduced warping, and eliminating the need to repaint. Although many alternative materials offer these features, pricing can be a major tiebreaker among selection criteria." Window Materials by Percentages. Total Units in Millions (MM). You can expect incredible longevity and high resistance to natural elements, unlike wooden or aluminium joinery. When wooden and aluminium windows are exposed to moisture, boring bugs or salt air, you will see changes to the look of the windows. Over time, the structural integrity of the joinery will weaken. However, uPVC is completely immune to rot. It doesn't corrode even when exposed to salt water. It is impervious to bugs and never needs to be repainted. Even scratches are hard to see because the exterior colour matches the interior. There's simply no colour 'coating' or paint to scratch off. 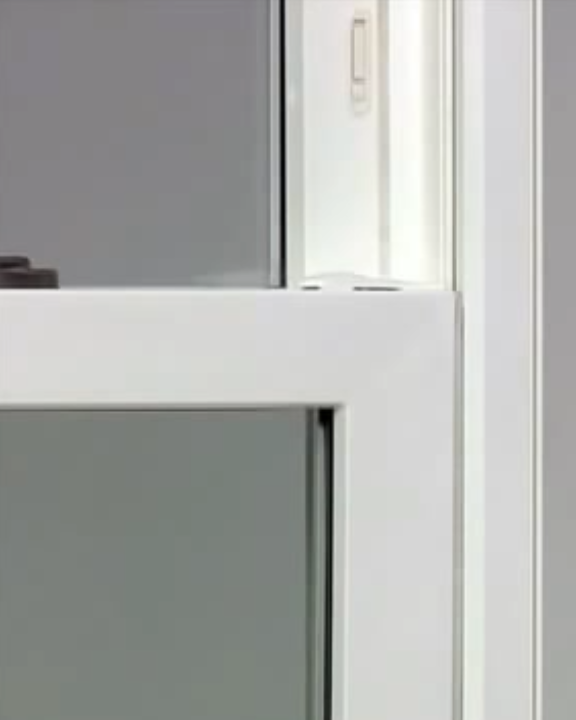 All Pella uPVC windows have welded corners. These welds are strong and durable, and completely weather resistant. The welding of multiple chambers within the frame (see above) also help resist warping and twisting due to external forces. This makes a strong window that is more durable and withstands the rigours of everyday usage. Did you know, all ThermaScreen windows come with seamlessly integrated insect screens? Whether you prefer the NZ traditional awning style, casement style, or horizontal or vertical sliding windows that eliminate injuries to those walking outside of the home, all windows come standard with integrated (not after market, upgrade, or add-on) insect screens. While UV radiation stability in uPVC windows was a problem 30 years ago, uPVC window technology has advanced so far that UV stability is no longer a problem. Reputable uPVC window manufacturers surpass the NZ UV stability requirements set by the Window and Glass Association of New Zealand – in fact, building plans and permits wouldn’t have council approval if they didn’t. Unfortunately, New Zealand’s outdated knowledge and hearsay around uPVC UV stability means Kiwis haven’t been enjoying the insulating benefits of these windows, which vastly out-perform (even) thermally-broken aluminium. We’re certainly working to educate and advocate for change – so are our customers who now have warmer, drier homes. While we do screen our windows, we don't screen our calls or emails. Get in touch for questions or quotes today. Hi there. How does pvc go with our high UV we are exposed to here in NZ. Somewhat different than he US i would. I welcome feed back. Had a friend just deal with you and gave you top marks. The Window Association of New Zealand (WANZ) has created a set of standards for uPVC products sold in New Zealand to ensure they meet the UV light and durability requirements for our conditions here. All of our uPVC windows meet these requirements. Just for those people who are not as familiar with UV considerations as you are, New Zealand has about 40% more UV light than the northern hemisphere. For this reason, there are different and more strict requirements on uPVC products in New Zealand to ensure that they meet the E2 durability requirements in the NZ building code. More information on this topic and a document that certifies that our uPVC windows, as manufactured by Pella, meet these requirements can be found here.